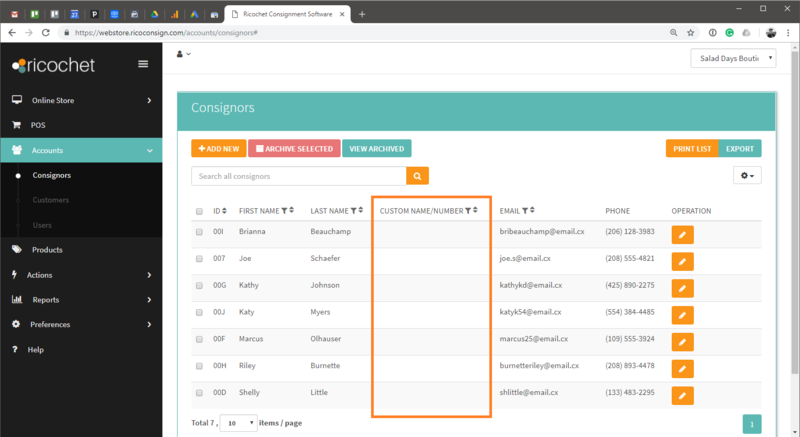 Particularly useful for vendor-based businesses, this field will allow you to have an additional identifying name field for your consignors. Rather than put a booth or account number in the first or last name field, there is now a dedicated place for it. This function is also searchable and filterable, just like everything else in consignor accounts. Finally, if you have been interested in switching to Ricochet from Liberty4, we know there is a commonly used field for Account Numbers that is important to a lot of their users. In the past, we haven’t been able to transfer that information over and it can make for a frustrating routine change. With this addition, you can now make the transition into Ricochet and keep those account numbers you know and love. That’s all for now. We have a huge development roadmap loaded with tons of little features and a few major updates coming down the pipe. Be sure to follow us on Facebook where we actively update the community as new things are released.